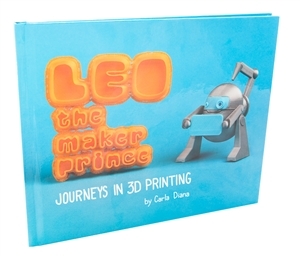 I am proud to announce our publication of a new book by designer Carla Diana called “Leo The Maker Prince.” It’s a book that parents (or teachers) might read with their children to understand what 3D printing is all about. Somehow, 3D printing sparks people’s imagination. Perhaps the best way to introduce 3D printing to children is to tell them a story about it. “LEO the Maker Prince” is the story of a young woman who meets a 3D printing robot on a fateful day in Brooklyn. The book shows that a 3D printer can be used to make many different things, some of which are fun and decorative and others that are practical and useful. Children might wish to make some of the objects from the book from the design files that Carla has made available on the website for the book, LEOTheMakerPrince.com. Children can also create stories of their own, perhaps with their own 3D printed characters in hand. LEO The Maker Prince is a great gift for the holidays. You can order the book from Maker Shed or on Amazon.